Our specially designed system leverages programmatic photography and image recognition technologies to detect the aurora when it is actually visible and then notify users. The camera system is automated and streams photographs through imgage recognition processing, which detects the confidence score of visibility. When detected with high confidence, notifications are sent to subscribers. The photographs are streamed to the website where they are available to view in real-time on the webcams page. The photographs are also automatically generated into timelapse videos illustrating the large change over time that human perception has trouble recognizing. A custom 3D-printed weatherproof and insulated camera box houses the equipment for programmatic photography. Photographing the aurora in Alaska's winter weather requires mirrorless digital cameras with low light lenses, accompanied with a mini-computer, and all housed in a 3D-printed weatherproof camera box. The camera system leverages programmatic photography to achieve the best quality shoots from day to night throughout all weather conditions. Image recognition is implemented to identify the aurora in photographs. When the aurora is detected with a high confidence level, notifications are sent to subscribers. After the photographs are streamed to the web, an automated video production process turns them into timelapse videos - providing the ability to visually see change over time. Adding light sensors to the camera box exterior that will be connected to the system through the Raspberry Pi. This would allow the programmatic photography script to set the exposure length (F-stop) immediately without needing to take two photographs and then comparing them in order to ensure optimal settings throughout the day and night, and changing weather conditions. Adding temperature and humidity sensors inside the camera box to help understand the need for heat requirements in the winter and possibly reducing the power requirements of the heat pad. Migrating Sony SDK functionality from Python to Golang. Since the main programmatic photography app is in GoLang, having the code to control the Sony camera in the same language will enable better integrated logging and metrics. Test syncing two cameras to take photographs with the same settings and then stitching them together. Since Valdez is nestled at the base of 3000ft mountains, this would provide a broader view of the sky. 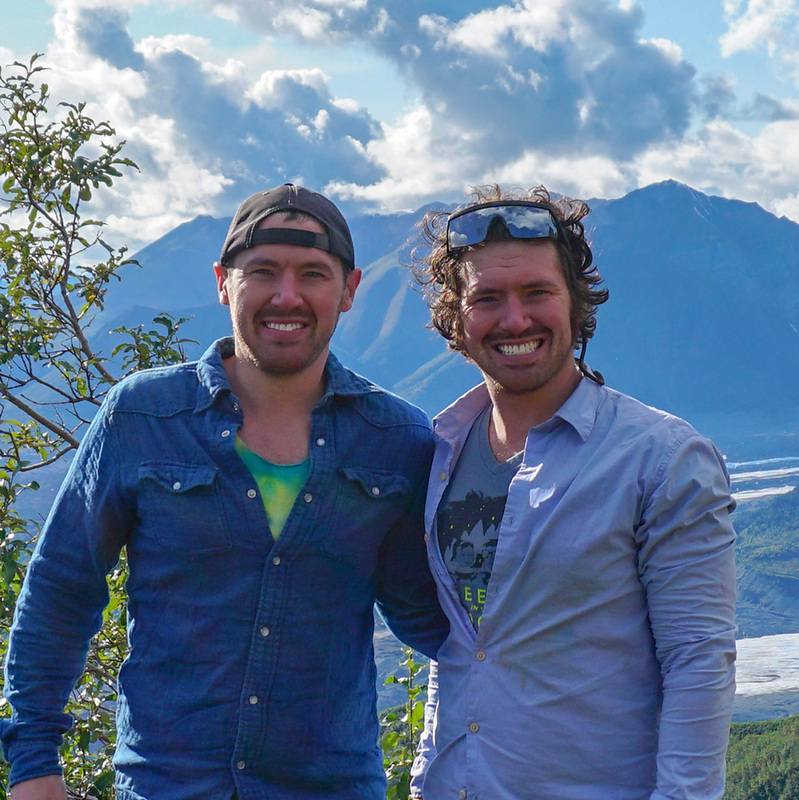 Since the Founders are entrepreneurial software engineers, they prefer focusing on creating solutions with code and not wasting precious time managing servers. Thus, they are excited with the evolution and growing trends of serverless architecture. 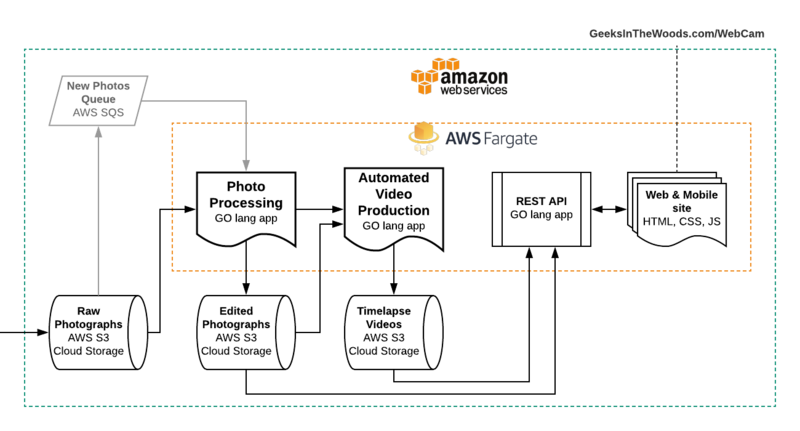 As you can see in the above diagram, the Photo Processing system, Autogenerated Video Production system, along with the API and web app are all deployed on AWS Fargate, rather than on AWS's old standard of EC2 instances. While EC2 instances provide access to the VM, Fargate only allows access to the task. Thus, deploying to EC2 only abstracts to the hardware and requires software engineers or their IT ops teams to deploy and manage servers before software can be deployed and managed. Fargate abstracts at the hardware level to the task level. Software engineers no longer need to provision and manage servers before deploying and releasing software. With Fargate, software engineers can focus on deploying and releasing the tasks their software was designed to achieve. Lee Brown, co-founder of Geeks in the Woods, shares his experience with Serverless Architecture in October 2018 in the presentation below. Ready to get notified of active auroras?